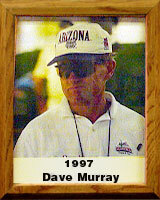 Dave Murray, a University of Arizona graduate in 1965, became UA head men’s cross-country coach in 1968; head women’s cross-country coach from 1978-81; head men’s track coach in 1982; and in 1990 became director of track and field/cross-country for both men and women. Some of Dave’s team accomplishments include six Pac-10 cross-country championships (highest finish – 2nd in women’s finals in 1980 and 2nd in men’s finals in 1984). Dave personally coached his distance athletes in both track and cross-country to 75 NCAA All-American honors; coached five members of the U.S. Olympic teams; and had nine NCAA individual champions in the distance events since 1986. Dave has been Pac-10 Cross-Country Coach of the Year six times, NCAA District 8 Cross-Country Coach of the Year six times; NCAA Cross-country Coach of the Year, Mountain Pacific Sports Federation Indoor Track Coach of the Year three times, and NCAA Indoor Track Coach of the Year three times. In 1995, Dave was inducted into the Drake Relays Coach Hall of Fame, was awarded the University of Arizona Silver Anniversary Award, and the University of Arizona Alumni “Bear Down” Award.